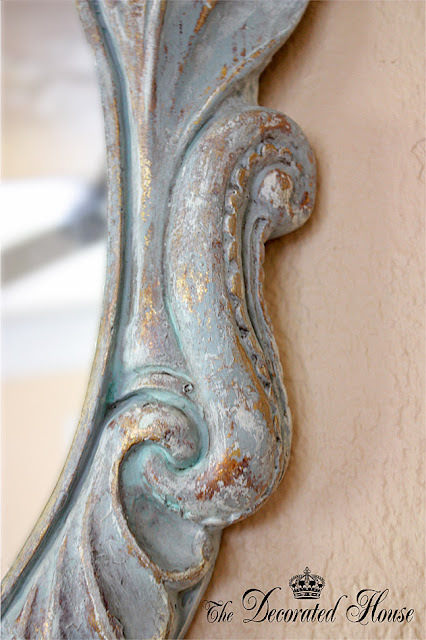 Above is the old mirror in its original, dull, gold finish and it just didn't work, so it was the perfect candidate for playing with the paints and wax since it had a great shape and nice details. The first color was the bright ASCP Provence for layer one. For layer 2, I mixed the Provence with Paris Grey. But areas of the Provence were left to show a bit more. This needed to dry just a little while so that I do a light amount of dry brushing with white, either Pure White or Old White will do. In the picture above, you can see small amounts of the white showing; it may look like reflected light. The next step was to do a bit of distressing with a "wet distressed" method. How much water you used depends on the look you are after. In this case, my cotton rag (t-shirts work great!) was just a little damp. And the picture above shows what it looked like with just using a damp cotton rag to rub off some of the paint. It was a good look even at this point. I did not sanding at this point, just the wet distressing. 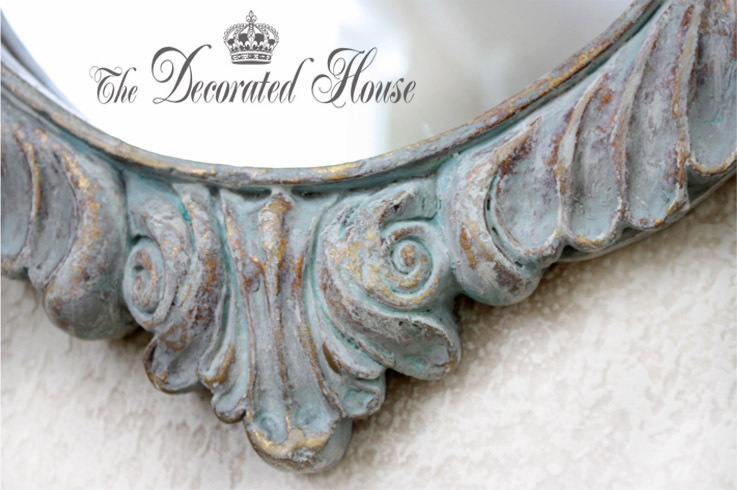 Usually you want to let chalk paint rest and cure for your finished project. It can take up to 30 days for it to really be fully cured. That is exactly the reason that all these steps work so well. The paint is dry to the touch, but it is not really fully cured yet. Also the paint is very matte flat. If the paint itself had a shine to it or a plastic feel like latex, it is harder to accomplish. For the next step, I went back and forth with dry brushing the white paint, letting it almost dry and then waxing over it until the paint began to come off, then painting again, and wiping that off in some places. Why?? As you can see, you are exposing some bits and pieces of the various layers controlling all the time how much you want of each to show and exactly where it shows. Dark wax was applied next, it was buffed, some places got another dry brushing, then the clear wax was applied and buffed last. You just play with it and see how your piece looks with each step until you get what you want for yourself. In the end, it looked like a very old, time worn finish. A really beautiful look! be confused with chalkboard paint. Beautiful, Donna! It really stands out now! I'll bet you learned a lot from doing this technique too, using the paint and waxes together. Oh, it's gorgeous! I love the finish you were able to achieve. 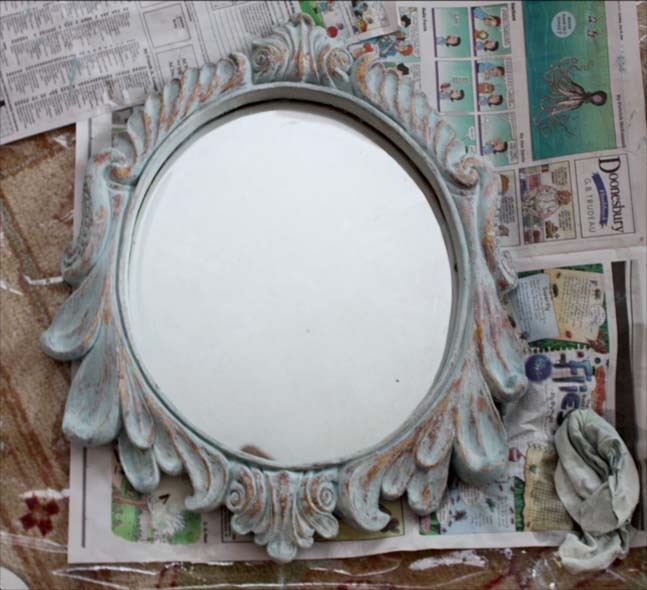 I have been meaning to order some chalk paint but keep putting it off -- partly because I can't decide on color! But this looks so good, I'm inspired. The mirror turned out beautiful! Your post is so timely, because I just painted a gold mirror tonight and wiped off most of the paint. I wasn't sure if I should wax it or not, but after seeing your mirror I definitely will wax it. That turned out gorgeous Donna! Your mirror is beautiful. 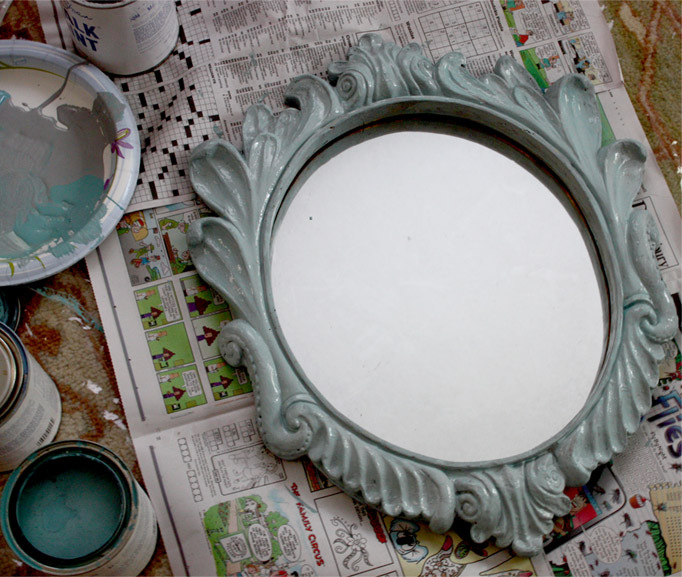 I'm ready to try some chalk paint, too. Can't decide what will get the makeover....yet. Very nice. Love the look. Great looking piece, your transformation using the AS paints is amazing. Thanks for sharing. This is an excellent tutorial and absolutely beautiful finished product. It is perfect for the mirrors I have to work in my new decorating scheme. Thank you so much!! It's really lovely! Thanks for showing how you achieved such a beautiful well worn and loved look! Donna, this is just gorgeous! I LOVE it! I bought some Annie Sloan in Old White and am planning on painting my buffet....I need to get the wax. Wonder if Minwax has the same effect??? 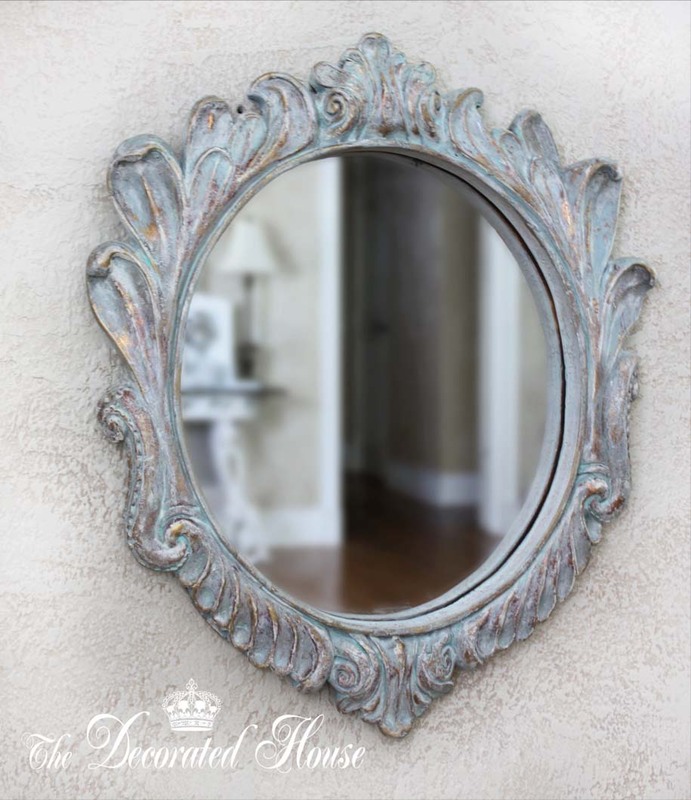 This mirror is a show stopper! Truly spectacular! I so need to experiment! Love the finished mirror, you did a great job! Wow, it looks gorgeous! You did such a wonderful job on it...not sure I'd have that much patience. I know you're really going to enjoy it! I love the color of this mirror!! It is so pretty! I absolutely love it! I'm in Oregon, should I send for my Annie Sloane? Did you buy or send away on line for yours? Beautiful, love the finish you achieved. Love how this turned out. BRAVO! I wanted to let you know that I've got a great giveaway that ends Friday. It's for $100 to wallquotes.com, and trust me they've got something I know you'll love! Stop by and enter ASAP. I'd love to see what you would do with their products! See you soon! This mirror is beautiful! I need two of them. ;0) One for Alaska and one for the beach apartment. Absolutely gorgeous! I also followed your line "Is Chalk Board Paint Worth The Price" and appreciate your tips. P.S: FYI years ago an Antique Dealer demonstrated to me how a quality 'Automotive' Paste Wax applied to furniture often can restore a piece back to its original finish. It definitely does works as I've used it on more than one occasion since then and found it works particularly well on deep scratches. On more comment to agree with the last note. Yes! I have often used the better brands of paste wax found in the automotive area. It is fabulous, and works great on furniture. What a great job you did! Love the finish you created, it is just beautiful. I want to try this...have the perfect piece for it! I have to say, I have been pouring over the internet for days and this one has got to be the most beautiful mirrors I have ran across! I love it! Can I ask what brand of paint the Provence and Paris Grey are from? 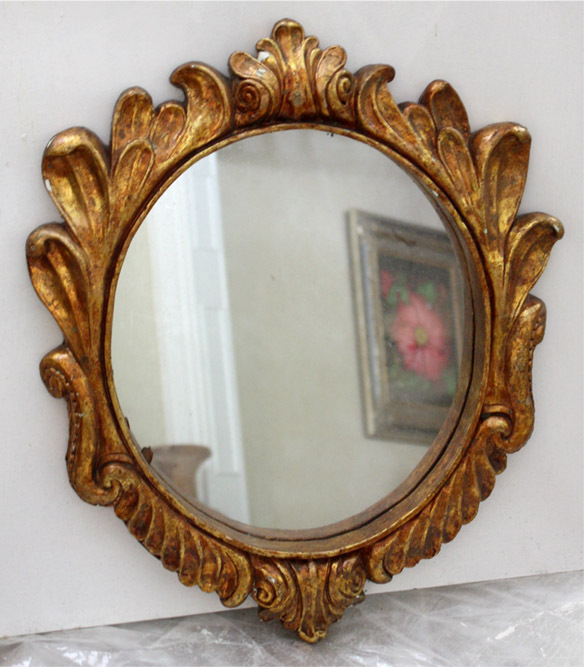 I have a mirror as well and I am wanting to refinish it. These colors are perfect! Thank you! The paints are Annie Sloan Chalk Paint. Hopefully you can find a stockist near you since the shipping is usually really high. The paint really does go a long way when paint furniture pieces so for me it's worth the price which is 3x's the price of a regular latex quart of paint. I want to thank you all again for letting me know how much you enjoyed this post. The brand of paint used is "Annie Sloan" Chalk Paints which you can order online or get at a retail store near you if you can find one. That's could save a lot on the cost of shipping. What a fabulou mirror - I have done some painting but not as adventurous as yours - that will happen now I am inspired. I use Annie paint all the time, in my antique store. We repurpose everything. This is stunning, thank you for sharing your work, love it! How has the beautiful post escaped me this long?! I am in LOVE with your vision for this piece! Truly a work of art! I am very grateful also for your sharing your technique. Wow! Love this! The mirror turned out beautiful. So you painted the mirror with the bright provence and let it dry, then you mixed the provence with the gray and painted the mirror again? Did you allow the provence and gray to dry completely before dry brushing on the white paint? What kind of wax did you use? Pinning! Hello to Each of You! Thank you again for your lovely comments. I have looked over the post and reworked the wording on some of the steps to make it as clear as possible for you to try this for yourselves. If you still have any questions, just let me know! Post it here in the comments and I will get back to you. Hello Donna, this is fantastic and I pinned. I love this idea. It's an like working with glaze in respect that it gives you the ability to have the chance to make the paint to give a certain look. Thanks a million for this post! I WANT this mirror! Is there any way to find out the company that manufactured it or the store it was sold at? I'm so extremely picky but this mirror is just right. I had the mirror for a several years. It was most likely very inexpensive since I was happy to use it for a paint project. But I'm sorry, I have no idea where it came from.